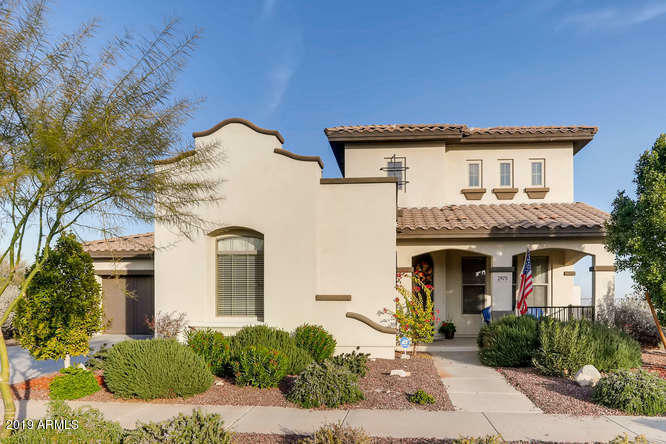 All VERRADO PARCEL 4.905 homes currently listed for sale in Buckeye as of 04/24/2019 are shown below. You can change the search criteria at any time by pressing the 'Change Search' button below. "This STUNNING 5 bed/3.5 bath home(Master is downstairs) is all at once elegant and comfortable. Cathedral ceilings, GOURMET kitchen, GRANITE counters, GE SS appliances,butler pantry. The family room includes a Media Niche, Surround Sound & Built-in Desk/Cabinets. A utility sink & cabinets complete the Laundry room. An extended length garage for your all your storage and solar panels (leased), keeping energy bills to a minimum. The backyard has a view that most could only dream about. At night th"